Sometimes I get those sudden urges to just go to a restaurant to have desserts. I was going to be out all night, already fuelled with a can of red bull to keep me awake, it was a hot day, ice cream was calling for me. 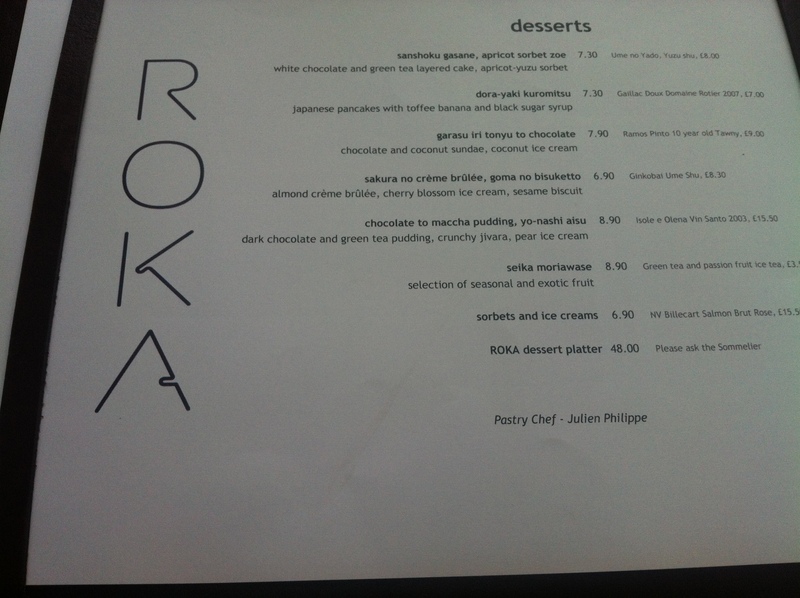 Roka was always a place I wanted to try, but no one seemed to want to go with me because of the prices. I went along to the Canary Wharf branch; the lift transported us to the top of the roof terrace, overlooking the beautiful skylines of Canary Wharf. I told the waiter straight away we was only after desserts, he seated us in a cosy corner with a married couple. One of the Olympic events was showing at the screen in cabot square and the evening was buzzing with happy diners and Olympic spectators. Now the dessert menu, there was a selection of 8 dishes to choose from, my eyes were instantly glued to Sakura no creme brulee. I love crème brulee, the creamy egg vanilla custard, with a layer of hard caramel. Roka version did not disappoint. 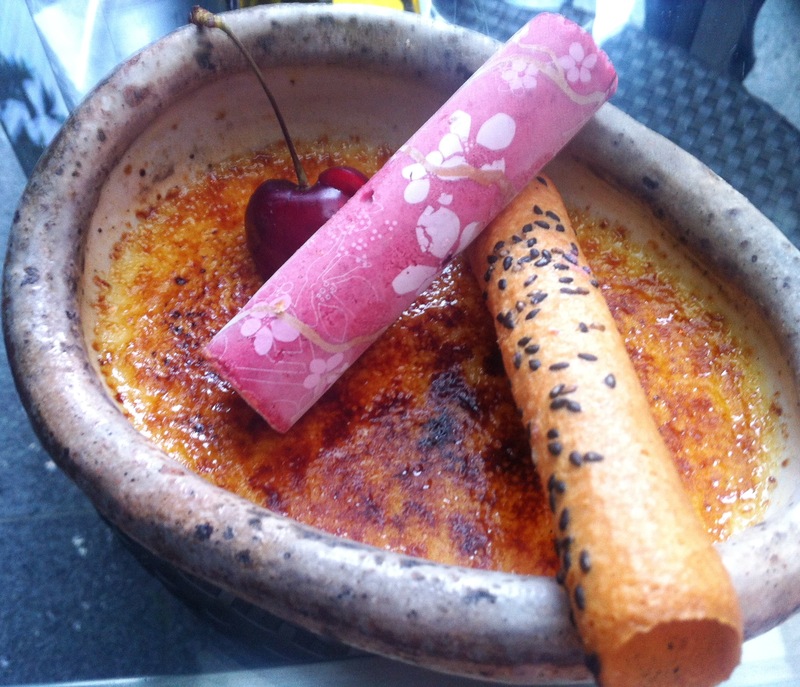 Cherry blossom is one of my favourite scents and the sorbet par well with the almond crème brulee. The sakura blossom cherry ice cream smelt fragrant and tasted amazing. It had sakura blossom prints on the sorbet. The sesame biscuit, reminded me of the Chinese egg rolls, crunchy light and crispy. 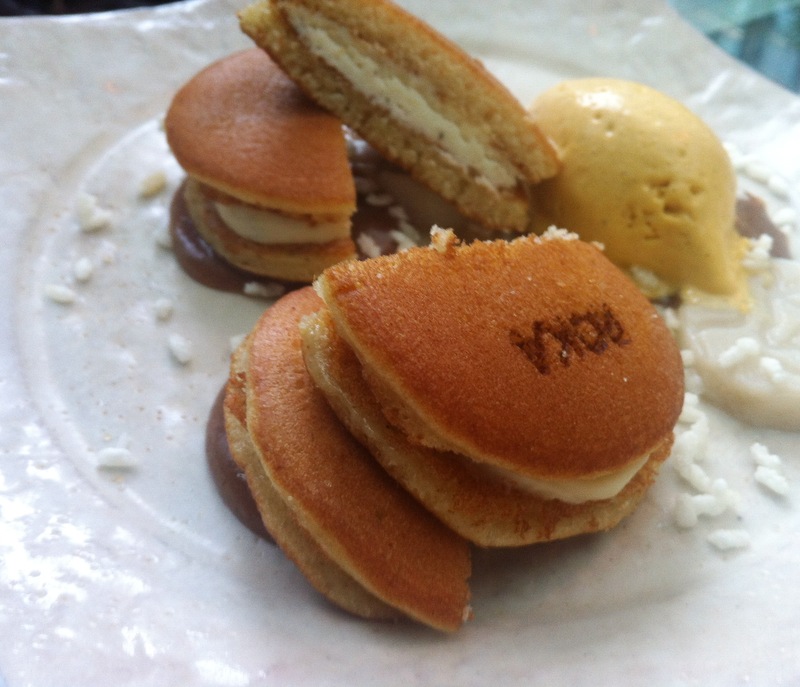 My friend ordered the dori yaki kuromitsu, Japanese pancakes with toffee banana and black syrup. In total the bill was around £22 including a bottle of artesian water. Next time I must try the sushi, food and the rest of the desserts.